In today’s world, where everything under the sun is now available online, people have begun to take decisions on the basis of the reviews, suggestions, recommendations and descriptions they read on search engines, social media and other such channels. With the audience evolving in such a way, it becomes vital for any business/brand to have a strong and good reputation in the online world. As an Online Reputation Management company in Delhi since the last 16 years, we have worked with countless businesses in managing their reputation online, especially in the circumstance of a negative review. These negative reviews can be about products, services or companies on various platforms like Glassdoor, Amazon, Google, public forums, blogs, or even personal social media accounts with a good number of followers. At DigitalOye, we tackle such situations with a lot of care and sensitivity and adopt various measures to manage a company’s reputation. 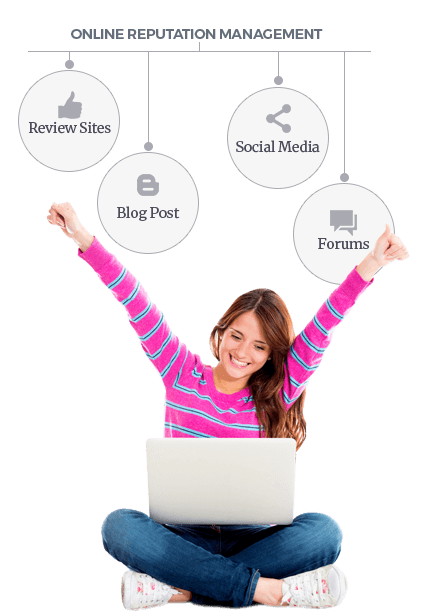 We focus on reducing the ranking of negative reviews and populating positive reviews in an organic manner. Our specialized workforce ensures that the root of the problem is addressed to save any sort of damage to your reputation. Identify all sources over the internet that may have such negative influence on your brand. Get in touch with Google Webmaster to remove any fake reviews whatsoever. Push down these pages in search results by organically focussing on the positive aspects. Reach out to the author and correct any misinformation that may be part of that adverse review/comment. Create pages and microsites around your products/services/brand with desirable content to reach your loyal and potential consumers. With this you need not to worry about the fake reviews and the negativity present on web, and can focus on what's important for you and your users. This will help you to influence the serach suggestions on search engines and helps to remove the bad reviews, rip-off reports and unfair complaints and boosting postive web content. We understand that Online Reputation Management Services plays an important role in the brand enhancement, big or small. Regardless of your exisiting image, it is impossible to predict the future or any event that will lead to the decline of the Brand image with fake reviews and content, we ensure the best defence for that scenario.